Corsair announced the immediate availability of its Accelerator series of cache solid state disks. These are available in 30GB, 45GB and 60GB capacities for $69, $84 and $99, respectively. Corsair, a worldwide designer and supplier of high-performance components to the PC gaming hardware market, today announced the availability of the Accelerator Series SSD cache drives. The Accelerator Series is designed for desktop PC users who want to give their Microsoft Windows based PC a dramatic performance boost with minimal cost and hassle. Corsair's new line of SSD cache drives includes premium Dataplex caching software from NVELO, for improved boot times and lightning-quick file access. After connecting an Accelerator Series SSD cache drive to their computer's SATA port and installing the caching software provided with the drive, users will see an immediate speed boost. No drive mapping, no reinstallation of the operating system or applications, and no complex file management is needed - the Accelerator Series SSD cache drive works in tandem with the customer's existing hard drive to provide optimized performance. Customers may see an improvement in read/write speeds of up to 5x their current hard drive performance after installing a Corsair Accelerator Series SSD cache drive. "The newly available Accelerator Series SSD cache drives are some of the most cost-effective solutions for boosting PC performance without the complexity of drive swaps and reconfiguration," said Thi La, Vice President of Memory Products at Corsair. "They are ideal for PC users and enthusiasts who want to improve their computer's speed without the hassle and expense of a full system upgrade." Accelerator Series solid-state cache drives support Micosoft Windows 7, with Windows 8 support planned, and are compatible with SATA 2 and SATA 3 ports. 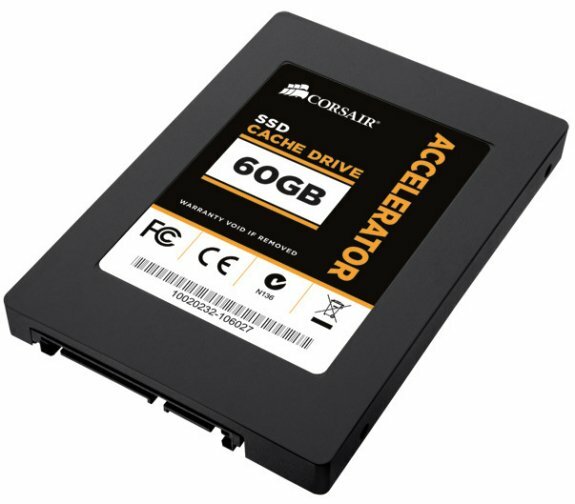 Accelerator Series solid-state cache drives are backed by a three-year warranty and available now from Corsair's worldwide network of authorized retailers and distributors at a US suggested retail price of $99 USD for the 60 GB model, $84 USD for the 45 GB model, and $69 USD for the 30 GB model. Note that stated capacities are unformatted.